Host a dinner-dance at the Green Farm Barn, pictured left above, which comfortably seats 140 guests. If you have a larger group, or just want to take advantage of the gorgeous scenery, take things outside! 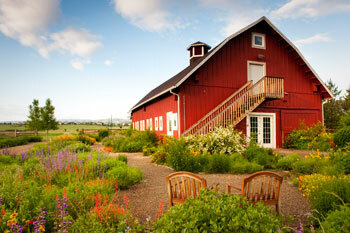 The private outdoor patio and grass area adjacent to the barn can accommodate over 500 guests. Now that's a party. If you're looking to have something on a slightly smaller scale, look no further than the charming Deer Creek Schoolhouse. 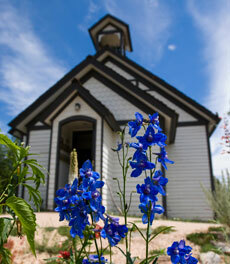 The one-room schoolhouse dates back to 1875, making it a quaint location for a ceremony or bridal shower. For a distinctive space with incredible garden views, check out Marnie's Pavilion. The indoor facility is full of unique features, including floor to ceiling windows, fresh orchids and ferns, and a two-story tall waterfall! This room allows for 100 standing or 80 seated guests. Mitchell Hall is another great option, especially for big events. 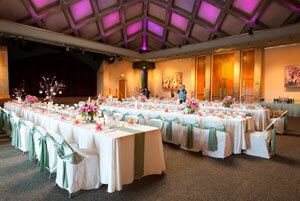 As the Gardens' largest indoor rental site, the elegant facility can seat 220 guests. It's also perfect for corporate meetings, where up to 300 attendees can be seated lecture style. A stage, kitchen, skylights and a balcony all accompany the use of this elegant space. 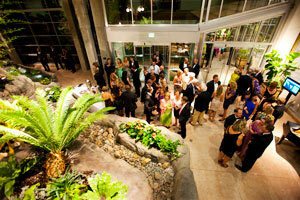 No matter what kind of celebration you have planned, the Denver Botanic Gardens have the perfect space to accommodate! For more information, and to book the Gardens for your event, be sure to check out their GigMasters profile.